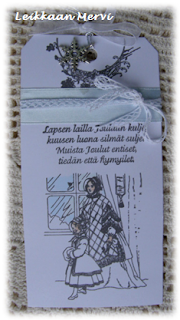 Hei, tervetuloa vuoden viimeisen Craft-Room haasteen pariin! Dt Hazel on valinnut teemaksi Tag'in! Nyt teillä onkin koko joulukuu aikaa! Minä tein kaksi nopeaa vintage tagia samantein. -Hi! 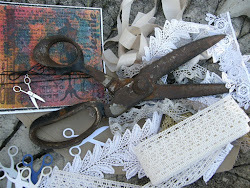 Welcome, at 2012's last Craft-Room Challenge! It's Hazel's theme " Make a Tag", and you have the hole December time to make an entry or three! 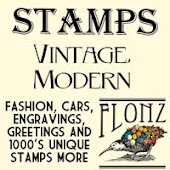 The sponsor for this challenge is FlonzCraft, a stamp company based in New Zealand. 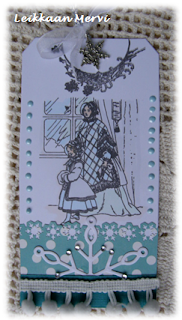 I used sponsor's vintage style stamp and corner stamp, coloured it a little with FlexMarker. close your eyes by the tree, remember the past Christmas times - I know you are smiling..."
Both are GORgeous tags! Such a pretty image and I LOve your colours. Beautiful tags Mervi, I love the image and the lovely sentiment. Kauniita tageja, kivan hillityt värit! Beautiful tags. Love the image and the added gems and awesome touch with the fringe on the bottom. So sweet! A great tag, love the sentiment and the image. the bottom section is great, thanks for joining us at Come and Get It. Great Tag, lovely design & and sentiment! Thanks for joining us for the Tag Challenge at Come And Get It, good luck! Hi Mervi, i love your tags! They have a lovely winter feel to them and such lovely wording.